Bio: Chef Yeatman began working in the restaurant industry in 1982 and as a culinary educator since 2002. 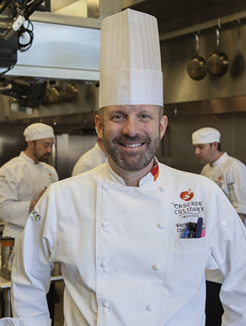 Chef Yeatman holds an Associate’s Degree in Culinary Arts – Newberry College, a Bachelor’s Degree in Hotel Restaurant Management – University of Massachusetts Amherst and a Master’s Degree in Business Administration – Texas State University. Chef Yeatman has also earned the Certified Hospitality Education (CHE) credential from the American Hotel & Lodging Educational Institute. Chef Yeatman has worked in various sectors of the hospitality industry including hotels, restaurants, contract food service, broad line distribution, healthcare, and retail grocery. Chef Yeatman has held management positions in both front and back of the house in both fine and casual dining realms. When he is not working, Chef Yeatman enjoys his family, wine and music. Certifications: ServSafe – National Restaurant Association Educational Foundation.